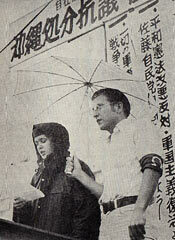 On May 15, 1972, at Yogi Park in Naha, Sharon Danann (left) delivered a speech with a U.S. Army sergeant at the protest rally held by the Okinawa Reversion to the Fatherland Council. Protest rallies and demonstrations against crimes committed by the U.S. military personnel were held in various locations of Okinawa, and Danann and antiwar GIs participated in those. She said, “We really respected Okinawan people’s movement. It was huge.” She said that she had learned a lot through exchanges with Okinawan people. After going back to the United States, Danann became engaged in various movements such as the GI Antiwar Movement, the Labor Union Movement and the Woman’s Liberation Movement. While working in the Occupational Safety and Health Administration of the United States Department of Labor, she works on race issues and anti-war movements. Danann stays interested in issues regarding Okinawa, contributing an article about the protest rally against the relocation of the U.S. Marine Corps Air Station Futenma in Okinawa to the Workers World newspaper on June 10, 2010 in which she explains the issues behind U.S. military bases in Okinawa. Danann also contributed an article about the protest rally against the screening of school textbooks by the Ministry of Education, Culture, Sports, Science and Technology to the paper on October 22, 2007.